Only 30 minutes or so from central London, Richmond Park is English countryside as you might imagine it depicted in a glossily illustrated Robin Hood story: mighty oaks, a thousand years old, dense forests, dinky copses, rolling hills, majestic fallow deer and burrowing rabbits. 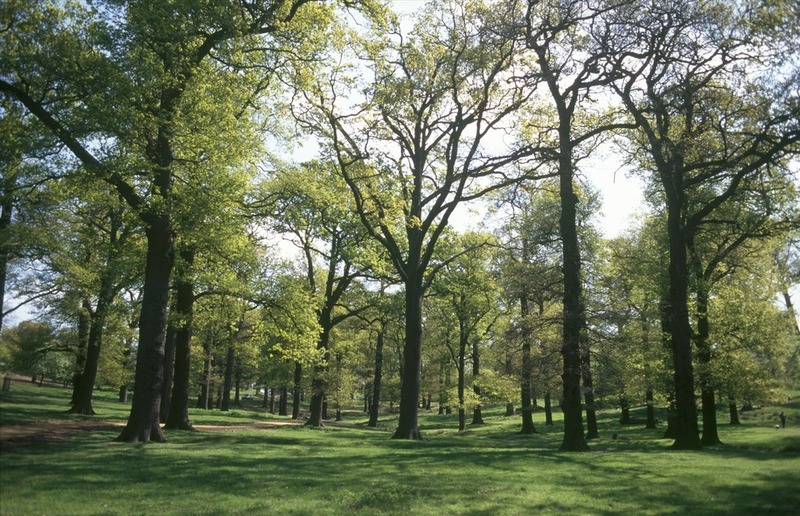 Covering almost 2,500 acres, Richmond Park is the largest Royal Park in London. With such a large space its hard to know where to start when visiting. A tall brick wall surrounds the entire park so you need to first work out which gate you are going to use to enter and then plan your route from there. The best way to enter is via Richmond Gate, heading first for King Henry's Mound. The park's position on the edge of town affords it some fantastic panoramas of the capital King Henry VIII's Mound is the place to head for uninterrupted views all the way to St Paul's Cathedral. Wherever you chose to roam via the ponds and Deer Park or circumventing the many lodges, make sure you end up at the Isabella Plantation. Heavily wooded and wholly organic, the Isabella Plantation bursts with massive mounds of azaleas, rhododendrons, camellias and magnolias and really is truly magical. Apart from a couple of roads running around the edge of the park (traffic is highly regulated and, for the most part, unassuming) the park has changed little since the reign of Charles I. Responsible for parks enclosure and the introduction of deer, Charles I sought sanctuary in Richmond during the plague. These days the park performs much the same function, offering a calming sanctuary from the pressures of city life. Enjoy. Rolling hills, mighty oaks, woods, deer and 2,500 acres of open space. Richmond Park gyms, sporting activities, health & beauty and fitness. What are the best dining options near Richmond Park London? The best pubs near London Richmond Park. Richmond Park clubs, bars, cabaret nights, casinos and interesting nightlife. Where to have your meeting, conference, exhibition, private dining or training course near Richmond Park. From cheap budget hotels to luxury 5 star hotels see our discounts for Richmond Park hotels, including Hilton London Syon Park from 0% off.